Good things took time with Hotel Beatriz Atlantis Spa Tenerife. Who would have thought that the Hotel Beatriz Atlantis Spa would become a new tourism icon of excellence for Puerto de la Cruz, a mere two or three years ago? The fantastic location of the tourist sky-rise hotel in Calle Venezuela with stunning ocean scenery is precious. Notice it by the popular Martianez part of Puerto de la Cruz with the Atlantic on one side, while the mighty Teide is in its back. In fact, I was last in Avenida Colon (avenue Colon) outside the Beatrice Atlantis Hotel on April 4, 2014. I look tiny in the picture but, what counts is the obvious, immense space there. Not to forget the unbeatable ocean views. Indeed, this Atlantic side of the hotel speaks for itself. There are peace and serendipidity for relaxing despite another main road close by, Playa Martianez at the end of the stunning avenue and the famous Lago of the same name only a few steps from there. The latter was buzzing with people and so was the Sun Telmo beach front a little further on. So it doesn't mean that there was a lack of tourists. Hotel Beatriz Atlantis Spa Puerto de la Cruz Tenerife. You are bound to encounter this concierge hotel Hotel Beatriz Atlantis Spa of Puerto Cruz, a mere 200 or so meters from Lado Martianez Lido, when you walk along Avenida Venezuela towards the end of town with its northern beach. I don't remember exactly, when a fire broke out in the Betriz Atlantis hotel. A friend of a friend had to move out at that time, as the fire fumes had traveled from the top of the hotel right down to the bottom. This hotel opposite the Puerto de la Cruz city surf beach Martianez was a poor sight for more than a year. In fact, the Hotel Beatriz Atlantis Spa had become off limits as a building site. Now, you can't help but notice this reborn tourist haven which has become the Hotel Beatrice Atlantis Spa by its new, elegant, white exterior. And the Spa has been added as a new service. Marvel at its renovation, once inside in its stunning hotel lobby with state of the art interior design and most beautiful furniture. 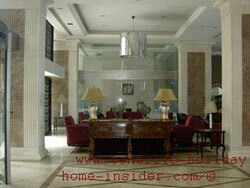 There, short walls and columns create cozy corners. Take a seat to relax and look out through big glass doors towards the outdoor pools. They are near the indoor pools. A Jacuzzi and fitness center are part of a Spa. Also discover a discretely tugged away bar behind the 24 hours/7 days reception desk. There, notice a proudly displayed note board of a hotel certificate. 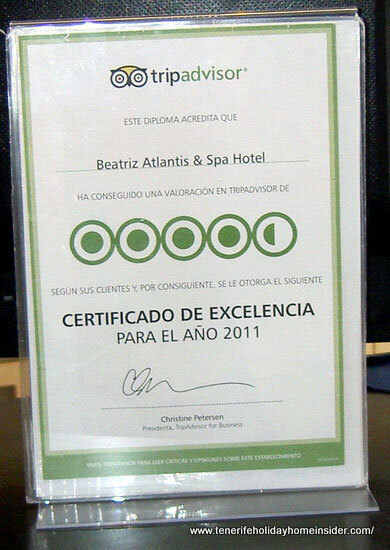 Click to enlarge and discover a Trip Advisor hotel certificate of excellence for year 2011 for the Beatriz Atlantis Spa hotel. 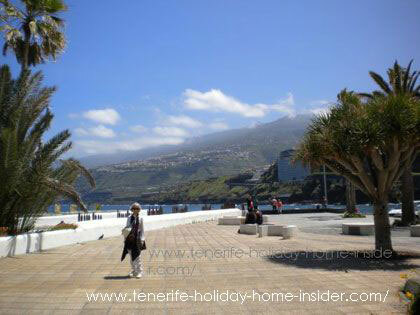 Consider it a hotel trophy which gives also credit to the oldest Tenerife resort of Puerto Cruz. Make use of the hotel's delicious breakfast of this high class hotel. Use its concierge services for business, tours, bicycle and car rentals as well as more travel to neighboring isles. There is just one downside of the hotel Beatriz Spa. The sun is only really guarantied for the outside pool of the Beatriz Atlantis during high noon contrary to the beach front hotel H2 Hotel Bahia Principe San Felipe which is next door and where I spent a few days once. This article about positive changes of Puerto de la Cruz which includes renovations by Playa Martianez at Avenida Colon is worth to Google translate. Indeed, not only the Hotel Beatrice Atlantis got a face lift in the oldest Tenerife resort. And the positive actions are not stopping in 2014. Return from Beatriz Atlantic Spa Hotel to Puerto de la Cruz hotels and apartments of Tenerife, the best of which were selected. More hotel accommodation in Tenerife.